I am hoping to visit the Kelpies by car on Saturday with my elderly mother who will be in a wheelchair. Any tips from people who have already visited here on how to make the very most of our day? You could also head up to the Falkirk Wheel afterwards, they have easy disabled parking right outside the entrance, a good coffee shop where you can enjoy your coffee and watch the Wheel in action, there is also a gift shop and the VisitScotland Information Centre which is onsite too has information and unique Scottish gifts, they've always been helpful when I've been in. Callendar House in the area would also be good to visit and is easily accessible. A great area to visit - hope you enjoy! Take the Tour option. You find out so much more than doing it all on your own. You also get inside the Kelpies. I found the signposted directions slightly lacking when travelling by car so beware. Hello Alison. I hope you and your mother enjoyed your visit. I live quite near the Kelpies and never tire of admiring them, whether I'm strolling around the Helix Park or on my way to work and shouting good morning to them from the motorway. There are plenty of good paths at the Helix and it is all getting green and leafy as the trees and plants get bigger. It is nice just to sit near the Kelpies with a picnic, as there is a good buzz with all the visitors and the boats on the canal. I can also highly recommend the Falkirk Wheel and Callendar House, both mentioned earlier. For cyclists, it is good fun to cycle along the canal path between the Kelpies and the Falkirk Wheel and visit both - or go by car or by bus 3 or 4 (to/from the main road near the Falkirk Stadium). The boat-lift in action is a sight to behold. Everything is wheel chair accessible but for disabled access you can call the guys at Carron Sea Lock to open the barrier for you to drop off 07810794468. The Kelpies are stunning and the facilities are good .For me Personally I like to see them in the evening, twilight is good and when it begins to get dark they are just amazing to see Great for photographs ! If you can get them at night with reflections in the basin superb ! Been at midsummer 11pm and it wasn't dark clear sky and it was simply magical ! When visiting them try and go at twilight , I can guarantee you will love it ! I was privileged to see the Kelpies when I went back to Scotland last Year on a visit.They are spectacular,quite an engineering feat,and thrilling to look at. The Kelpies are absolutely spectacular. 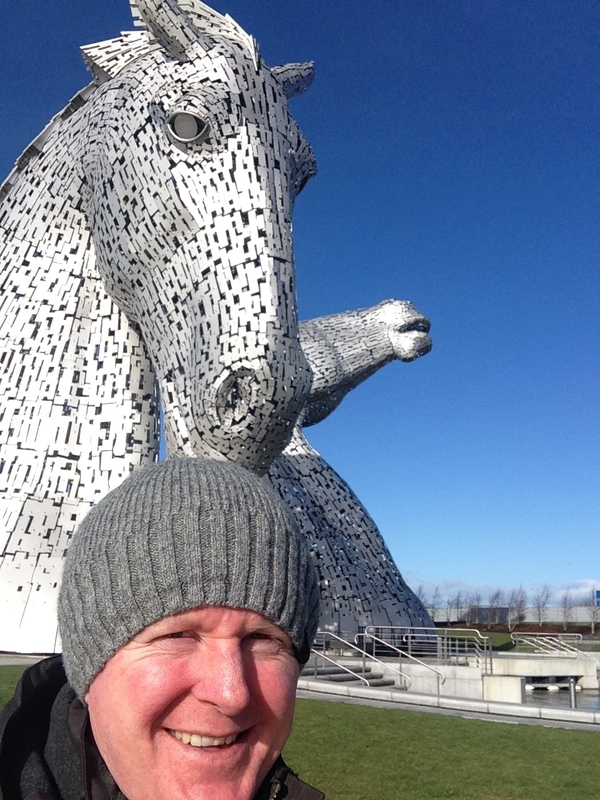 We managed to park the car for free at the Falkirk Stadium which was about a mile walk through The Helix Park but it was well worth it when we got to The Kelpies and the new Visitor Centre. Treated ourselves to a coffee and cake as well. We visited The Kelpies yesterday in amazing sunny weather. They were very impressive. It was our first time there but it won't be the last. We enjoyed a good Coffee & Soup in the visitor centre. I am sure that next time we will take the 1pm inside tour.